Here in Hawaii, we've been dealing with record-setting rains and even flooding of downtown areas, thanks to an unusually-busy hurricane season. Beaches have closed due to sewers overflowing and running off into the ocean, and the usually-blue skies have been endlessly grey for weeks. Our family has managed to squeeze in a little beach time here and there, but mostly we've been trapped indoors or the kids have been playing in the rain in our front yard. Over the weekend, we saw a small reprieve from the wet weather, and although the skies were still a bit grey, we braved the insanely humid conditions to head over to one of our favorite restaurants on the island, Monkeypod Kitchen. The food at Monkeypod is good and of great quality (albeit a bit expensive), but our favorite part of the restaurant is the cocktail menu and the open-air, laid-back atmosphere of their patio. 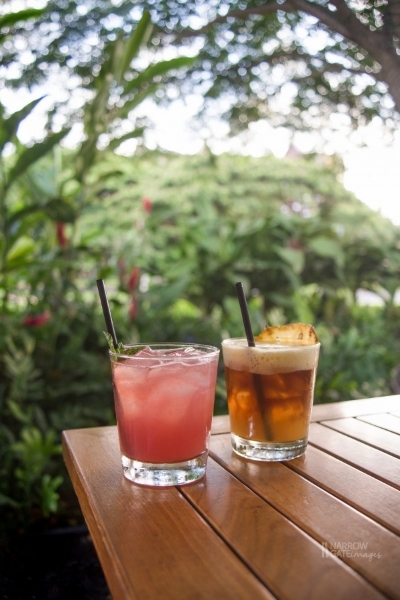 With live music every day and a gorgeous stone patio flanked by tropical flowers set in the shade of their namesake monkeypod trees, the restaurant is a wonderful reprieve from the day-to-day frustrations of island living. Brad and I sip a cocktail while listening to the trade winds mingle with the notes of the acoustic guitar, and the kids run and play in the grassy lawn surrounding the patio. A slice of the Hawaiian good life.